The following bullet points briefly summarise these features but we recommend that for clarification you refer to the Statutory Guidance for NQT Induction. Despite its name this is a very readable document and it will answer many of the questions you might have about the induction process. A teaching timetable that is no more than 90% of a main scale colleague = 10% NQT time which must be protected by law. The opportunity to undertake professional development activities. Ideally, observations and review meetings will be timetabled well in advance and this is something you should discuss with your induction tutor in your first meeting. Observations should focus on particular aspects of your practice, which are agreed in advance with the person carrying out the observation. These observations should be supportive and developmental, relate directly to the teaching standards and be accompanied by prompt and constructive feedback. The following is a brief outline of the key steps to undertake in laying the foundation for a successful induction. These steps are explained in greater detail in the following sections and in the supporting document links on each page. 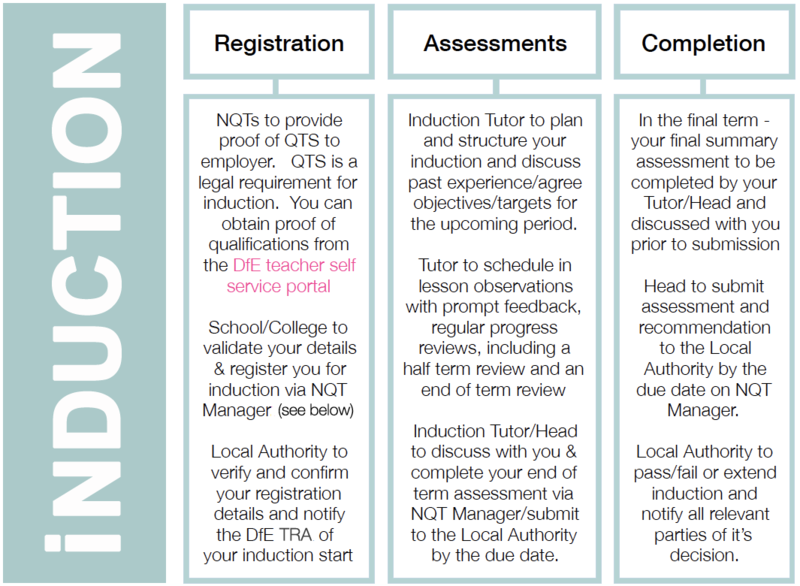 Please note: NQT manager is an online induction management system used by Manchester schools/colleges. Once you have been registered for induction you will receive a welcome email containing login details and further guidance. If you do not receive this email within 2 weeks of your induction starting, please liaise with your Induction Tutor/Co-ordinator/Headteacher.